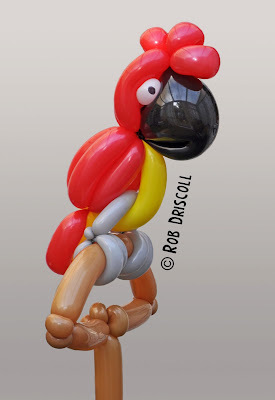 I have made this Parrot a few times recently due to me having a few pirate shows to do, he always gets people talking. He is made from 7 balloons, 2 red x 260s, a black heart shaped balloon, a white 160 for the eyes, a yellow 260, a grey 160 and a brown 160. Having made him a few times now I can now make him pretty fast.